If you look Grammy up in the dictionary it says: "A service mark used for any of the statuettes awarded by the National Academy of Recording Arts and Sciences for excellence in the recording industry." If that isn’t the understatement of the year I’m not sure what is. The Grammys in the music industry are like carb-filled, chocolate icing covered doughnuts to the obese kid in the bakery, which means they are pretty damn awesome. Sure, there are lots of other award shows, like the VMA’s, AMA’s, EMA’s, but the Grammys are in a league of their own. (Plus it gets old saying all those abbreviations.) Being nominated for a Grammy is worth something, but winning is priceless. Green Day is no stranger to the Grammys; they've visited them 5 times, the first being in 1995. Dookie was FRIGGIN HUGE, so it's no surprise it got 4 nominations. Basket Case was nominated for Best Performance by a duo or group with vocals. 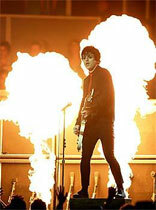 In addition to that, Longview was nominated for Best Hard Rock Performance and Green Day was up for Best New Artist. Their fourth and final nomination was Best Alternative Music performance, and the three little punks walked home with that one. Insomniac was also an astounding album and it was nominated for one Grammy, Best Music Video in short form for Walking Contradiction. Green Day didn't get to take this one home, but at least they were nominated in the 1997 Grammies. They were also nominated in 2000 for Best Rock Instrumental Performance with Espionage, but lost to Santana and Eric Clapton's song The Calling. Ray Charles was heavily nominated that year as well, and he took home the majority of the Grammys, but Green Day did proudly get to accept Best Rock Album for the sensational American Idiot. In their state of excitement the band members almost forgot to hold the Grammy, but the presenter reminded them and everything worked out. They went on to thank their friends, family, Reprise Records, Warner Records, and their EBPM team. In conclusion to such a memorable night Billie Joe summed everything up when he said "Rock and roll can be fun and dangerous at the same time..."
Just when we thought American Idiot had run out of momentum, Green Day proved us wrong. The 2006 Grammys were a great way to conclude the American Idiot era, which is exactly what happened. Green Day's massive tour had ended, American Idiot was slowly sinking down the charts after a phenomenal year, and it was time to let the creative process start again. With each member's significant other present, it made winning the one and only Grammy they were nominated for an emotional moment. Keeping their acceptance speech relatively short, they gladly accepted the Grammy for Record of the Year. At the 2007 Grammy celebration, Green Day and U2 recieved a nomination for their song The Saints Are Coming. The two sensational music groups were nominated in the Best Rock Performance by a Duo or Group with Vocal category. However, the two bands weren't able to walk away with that Grammy and it instead went to Red Hot Chilli Peppers and their song Dani California. Who knows what we can expect from a band like this in the future, with a past that contains 15 total Grammy nominations, it goes without saying that their future is looking pretty bright.